One In A Million: Images & Words 102 # One Word! Images & Words 102 # One Word! Joel has asked us all to submit one of our photos and place an appropriate word on the photo. Hope that you all like my choice here. Distance so beautifully captured Milli! Great shot and the word is perfect, Milli. Thanks for the visit to mine. Distance is finite and a marvellous picture needs more than a mundane description. Nature revealed in such scenic beauty is beyond man's endeavor to produce. Just call it what it is, Milliwork. great word for the photo and visa versa! The kind of distance all can admire and embrace. Images & Word(s) # 102~ " SYMBOLIC "
Stunning image, dear! Love the shades of blue. Distance indeed. Thanks for your comment, dear! Gorgeous shot Milli! I love those colors. Truly beautiful. I hope you have it matted and framed. It beckons me to sit and ponder it, as a good picture should. picture and the color and details are perfect. Great shot, people have gone leaving tranquility. 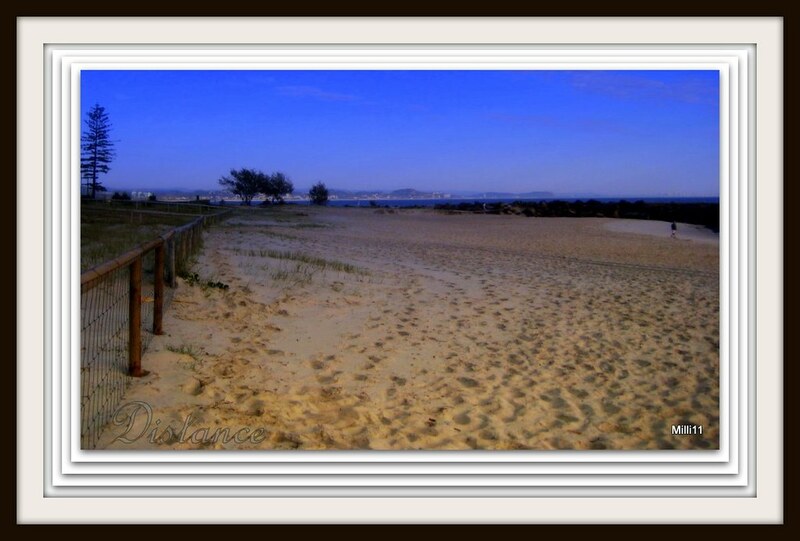 Wonderful capture Milli, love the many footprints in the sand and your composition! Great work. Wow Milli Love the way the color and lighting change over the distance...Great one !!!!!! This is the great catch of nature. that word absolutely captures the photo! Well done!!!! beautiful! I'd love to walk off into the distance here...very inviting. eye can see. So peaceful. Oooo My, I Love Your choice here!!! Thanks for stopping by and viewing my "BEEP"~!! Giggle~!! No way you are Fine in my book.